When I got to review André Rabe’s fantastic book Desire Found Me, it gave me new respect for the Bible. I saw scripture with new eyes. 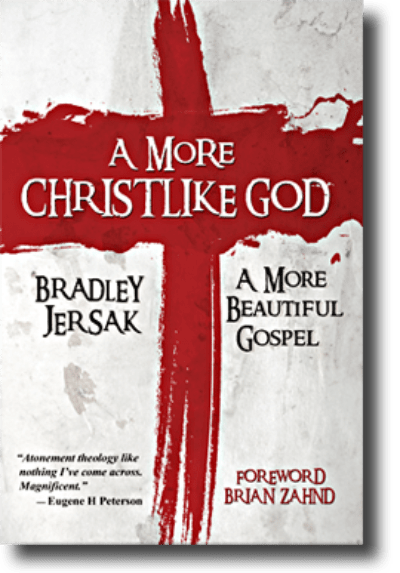 A More Christlike God, by Brad Jersak, is doing something different. Even though I can’t claim to know exactly what that looks like, Brad Jersak has the heart of a pastor. If André Rabe was all about re-lighting the atonement and the Bible and saving my mind, Brad Jersak is after my heart. (Fear not, André; my heart cannot be saved without my mind). While André blew my mind without bothering to bring up specific challenges, Brad has gone all-out with specific challenges. And when I say challenges, I really do mean challenges. I’ve found the wall I built up to keep out the monster-God under serious threat. And that’s a really good thing. On page 16, Brad describes a talk he gave at a Christian high school where a genuine doubter and skeptic, a girl he calls “Jess,” told him she wanted to believe but she had a lot of questions. He told her to ask away. And she went straight for the jugular. She challenged him with questions I’ve been wrestling with for a really long time. God torments people in hell forever. He said “no.” To all of it. There was no defense of how God could torment people forever. There were no carefully worded reasons about why the little babies deserved to die. There was no theodicy about sovereignty. Does that sound like Jesus? Jess believed the good news: That God is like Jesus. It was a gamble, of course, because he didn’t take the time to carefully defend every last claim he made. That’s what he spends the rest of the book doing. Brad isn’t afraid to confront the claims of the New Atheists, either. He names them and often agrees with their critiques of modern-day mainstream Christiainity. I respect that. Like a lot. But then in his pastor’s heart he starts looking toward the hearts of his readers, and sometimes it gets a little too real. They imagine he God who abandoned me. God, the Dad who was powerless to intervene when I was bullied. God, the Dad who walked out the door one day and never came back. God, the Dad I needed to listen and reply, but who never visited or answered my calls. God, the Dad I needed to show me how to grow up. God, the Dad I needed to be proud of me when I succeeded and supportive when I failed. God as absence – absence to painful that we need a breather. God, the Dad who was always demanding and wanted me to do a lot of stuff but only helped me out when he felt like it. While I don’t believe the first part at a conscious level, I know I’ve internalized it to some extent and I often have to fight it. The second part is something else that leads me into my toughest and primary critique of this book. I underlined those words. I thought they were great. And a few minutes later, those words dragged me right back down the rabbit hole. See, for me, “God doesn’t want to” makes a really convenient excuse. If I pray and sometimes I get out of my predicament and sometimes I don’t, “It wasn’t God’s will” is really convenient. The notion that my prayers are sometimes answered and sometimes aren’t, with no discernable pattern, is (to me) the toughest critique of prayer – and theism in general. How would things be different, prayer-response-wise, if God wasn’t there at all? It reminds me of a psychology experiment where people put a mouse in a box and trained it to press a button for treats. If they gave treats systematically (every 100 times, for example), the mouse pressed the button at a speedy but not entirely frantic rate. If they gave treats randomly (sometimes every three pushes, sometimes after fifty, sometimes after 200, the mouse pushed much more frantically than if they provided treats with some kind of reasonable pattern. Which, I fear, may be why we pray so frantically. The greatest strength of this book is also its greatest weakness: Brad Jersak is a pastor, not a philosopher. As such, when he talks about the cruciform love of God and how God sustains the entire world, I felt that he gave entirely too little attention to natural disasters. He didn’t offer a theodicy for it, or at least didn’t offer one that satisfied me. It sorrows me to say this, too, because it felt like we were working toward a sort of systematic theology that would put all the pieces together – something I could really believe in. As I was reading this book, I went through page after page and chapter after chapter, highlighting like crazy because there was so much that was so beautiful. One of my favorite parts was the chapter on divine consent, because I have never seen a theologian talk about consent. He talks about hell – straight for the jugular again – as a means of coercion, and suggests that if the popular idea of hell is true, we have no option for consent in any real way, and our love cannot be real either. A confession: I haven’t gotten far enough to see any strong and intense critiques of hell as so frequently depicted in scripture. This is not even Love Wins territory – and that’s fine because Brad isn’t talking about our eschatology; he’s talking about our Christology. For this reason, I wouldn’t be surprised to find out that he doesn’t bother to get into hell too heavily. From the chapter on consent, Brad keeps going. Everything from here on out seems to go back to consent. And as someone who only recently (the past few years!) learned about the critical importance of consent, I cannot respect that enough. This book is filled to overflowing with quotes I want to share and ideas I want to spread. I have my suspicions that someone who hadn’t taken so gosh-darn seriously a 400-level philosophy of religion class (which is probably most people, to be honest), would find this book heart-wrenchingly beautiful and challenging in the best way. Even for me, having taken 400-level philosophy classes, the parts where my overly-analytical brain doesn’t block me from buying it (which is most of the book) are heart-wrenchingly beautiful and challenging in the best way. We’re going to Lake Erie this weekend, and this book is coming with me. Besides my Greek homework, it’s the only book I’ll be reading. And I think you should read it too. David, thanks for the great review. I hope that as you continue reading, I’ll answer some of your good questions and critiques. I would esp. love to see you follow up with your reactions to ch. 14!